"Dear Iberosattel-Team, dear Iberosattel-fans, dear interested ... I gladly tell of our way to the "dream-saddle". We - these are my 17-year-old pure-polish thoroughbred mare and me. My mare I trained more than 15 years ago - at the age of 4 - under a western saddle. After a while I felt the need for better freedom of movement, so I decided to buy a second saddle: a dressage saddle for work on the court. For 6 years I then saddled my mare differently according to need - in the western saddle for railings, since this had the wider edition to spare the back of my horse even during longer rides, in the dressage saddle to work on the riding place with deep seat And sufficient leg room. At the Pferd International 2012 I was attracted to 'Iberosattel' and let me thrill. I immediately agreed with a 'attendant', to whom I looked joyfully. The "Iberosattel transporter" went into the yard punctually at the end of the day - lots of great saddles for testing. After the Proberitt and very competent advice was firm: It becomes a Dressage Andaluz - for me the perfect solution, both advantages of my existing saddles in a saddle to unite! 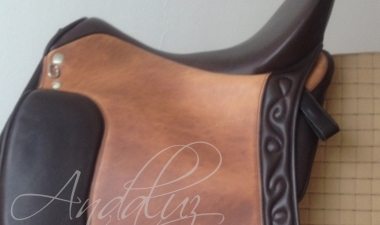 The saddle was ordered by the horse and the choice of leather and color. In the middle of March the dressage Andaluz arrived. Since that time I sit 4-5 times a week in this saddle and am still convinced - it was the absolutely right decision! !